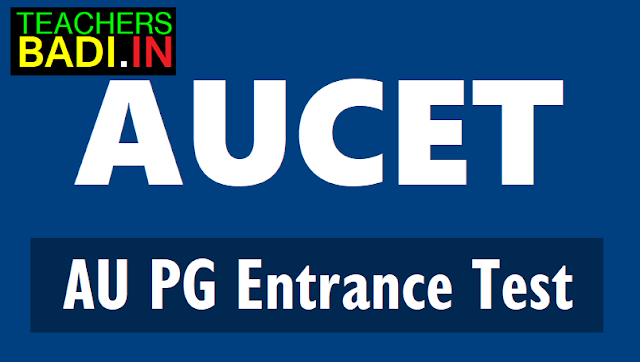 AUCET 2019, AU PGCET 2019, Andhra University PG Entrance Test 2019 Notification, AUCET Online application, AUCET Entrance exam date, Last date for online applying date for aucet, aucet hall tickets, aucet results, aucet counselling date, certificates verification and more details aucet web portal. AU Post Graduation Common Entrance Test 2019, AUCET 2019, Andhra University Common Entrance Test 2019 Notification/AUCET 2019 is a common entrance as Post Graduation Common Entrance Test (AUCET-2019). This test will be conducted by the Convenor, AUCET 2019, Directorate of Admissions Department, Andhra University for the academic year 2019-2020. Andhra University, Visakhapatnam and Dr. B.R.Ambedkar University, Srikakulam have issued Andhra University Common Entrance Test (AUCET) Notification 2019 on March ..., 2019 and Andhra University, Visakhapatnam and Dr. B.R.Ambedkar University, Srikakulam invite online applications for admissions into admissions into M.Sc., M.A., M.Com., M.H.R.M., M.J.M.C., M.L.ISc., M.P.Ed., M.Ed., M.Tech, M.Sc 5 -Year Integrated Course in Geology and M.A. 5-Year Integrated course in Economics, offered by Andhra University, Visakhapatnam and Dr. B.R.Ambedkar University, Srikakulam through AUCET-2019 for the academic year 2019-2020. AUCET 2019: Andhra University, Visakhapatnam invites applications for admissions into M.Sc., M.A., M.Com., M.H.R.M., M.J.M.C., M.L.I.Sc., M.P.Ed., M.Ed., M.Tech, M.Sc 5 -Year Integrated Courses in Geology and Chemistry (Applied Chemistry) and BFA Courses in AU Campus Colleges, affiliated colleges and Gurajada Appararo University, Vizianagaram through AUCET-2019. How to apply: Candidates may submit their applications through online mode only. Application Fee: Registration and Processing Fee of Rs.600 (Rs.500 for SC/ ST/ PHC) may be paid through Andhra Bank(billdesk)/ Payment Gateway(credit/ debit card). Andhra University has released the Andhra University Common Entrance Test-2019 (AUCET-2019) notification. Qualifying the test makes the students eligible for admissions into various Arts, Science, Engineering and Law courses offered by the varsity. The submission of online applications will commence on March 15. The applications will be received online till April 15 without any late fee and from April 16 to April 25 with a late fee of Rs. 1000. 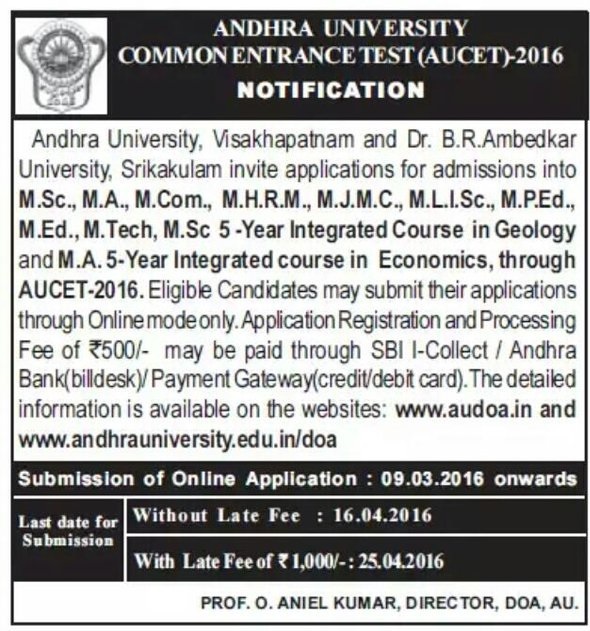 The notifications are available at www.andhrauniversity.edu.in/doa and www.audoa.in. The courses, fee structure and admission information brochure are available in these websites. The aspirants can download the hall tickets from April 28. The exams will commence from May 5. The results will be likely announced on May 15 and the admission process will start from May 25. So, Andhra University, Visakhapatnam has invited the applications for the admissions to various Post Graduate Courses in the university through Andhra University Common Entrance Test (AUCET) 2019. Admission through AUCET-2019 will be done to courses like MSc, MA, MCom, MHRM, MJMC, MLISc, MPEd, MEd, MTech, MSc 5 -Year Integrated Courses in Geology and Chemistry (Applied Chemistry). The online application has started and the candidates can apply now. As the continuation of Andhra University's earlier Notification dated March ...., 2019, the university also invited applications for admission into Prost graduate courses like MSc, MA, MCom, MLISc, offered in Dr. B.R.Ambedkar University, Srikakulam and its affiliated colleges through AUCET-2019. Time 9.00-10.30 A.M. 11.30-1.00 P.M. 2.30-4.00 P.M.
204 M.Com 106 Statistics 205 M.H.R.M. M.Sc., M.A., M.Com., M.H.R.M., M.J.M.C., M.L.ISc.,M.P.Ed., M.Ed., M.Tech, M.Sc 5 -Year Integrated Course in Geology and M.A. 5-Year Integrated course in Economics, through AUCET-2019. Eligibility: Bachelors degree in relevant discipline. Application Registration and Processing Fee of Rs.600/- for AUCET-2019 may be paid through Bank Challan/Payment Gateway(credit/debit card). Aspirants for AUCET/AUEET-2019 can also register their applications with late fee of Rs.1000/- for AUCET-2019 and Rs.1500/- for AUEET-2019 upto 30.04.2019 with online payment. Registration / Payment of Fee after 30.04.2019 will not be permitted under any circumstances.